Performance is the result or output produced at the end of a day, a week, or a year. If boosting your organization’s productivity, profits, and professional accountability is your goal, you need to create a persuasive performance management training strategy that will help your employees. The English proverb, “An organization is only as strong or powerful as its weakest person” couldn’t be truer when it comes to employee performance. The success of an organization depends on the performance of every employee and not just restricted to the best performers. Therefore, it is highly essential to develop a performance management training program that effectively caters to the needs of every employee. In this blog, I’ll be highlighting 5 instructional design strategies to create performance management training that you may want to consider. 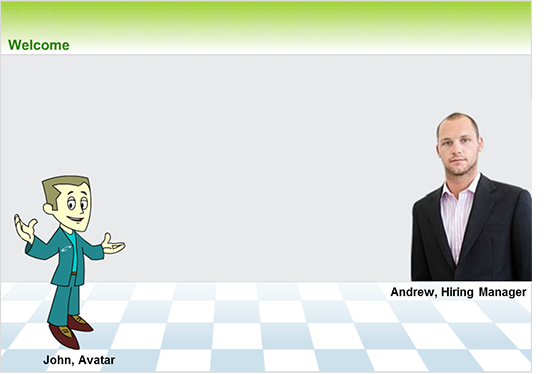 When it comes to introducing learners to the concept of performance management, you can use avatars. When you add a face to your modules, they can act as mentors and guides and help learners through the course. With the help of avatars, you can present your training in a conversational tone that learners can relate to better. When avatars are customized and used, they offer a personalized learning experience. It makes it easy for learners to connect with the course, thereby ensuring effective knowledge transfer. Also, avatars make learning fun and interesting as they can also be used to pose questions to the learners, giving them the opportunity to respond. One of our clients, a leading electronic goods manufacturing company, approached us with a requirement to develop interactive videos on Performance Management. They wanted to have a guided approach that could help learners and also make the course interesting. We suggested the use of avatars. The avatar introduced the learners to the topic and helped them through the course, explaining concepts, and also posing questions. When learners are presented concepts through scenarios, they are better able to retain the knowledge. You could weave a story around the issue and present the scenario to learners to decide the outcome. As they would be familiar with the concepts, they would understand the consequences of their decisions, in a risk-free environment. Scenarios present learners with a safe and secure training environment, giving them the opportunity to explore the repercussions of their choices. At the end of the choices made, learners are given appropriate feedback explaining the subject better. While developing scenarios, you need to keep in mind that scenarios are relatable and realistic to employees, making it easier for them to connect with the subject being explored. You can use real-life images or feature people or settings learners are familiar with or come across at their workplace. The whole aim of using scenarios for performance management is to support or reinforce certain behaviors; therefore, tying them with real-life issues or challenges can be an excellent idea. An African multinational energy corporation approached us when they needed to develop a module on the roles and responsibilities for their employees. Their issue was that there were major misconceptions among employees regarding performance management. To effectively deal with this issue, we came up with a scenario-based approach. Employees and managers were depicted in the scenario, effectively responding to the queries and clearing misconceptions. You can use Process Tables when you have to explain stages of a process that has steps, actions, and responsibilities. They can also be used to explain the lifecycle of performance management. When process tables or flowcharts are used, you can promote better understanding among learners, represent abstract processes, and reduce cognitive overload. For instance, if you were to explain the appraisal procedure to your employees, you could use the process table to show them how appraisals are conducted. You could begin with the process followed, and then proceed to the mid-term appraisals, and then finally the annual appraisals. We developed a module using process tables and avatars for one of our clients, a leading Oil and Gas company. They wanted to train their employees on the various steps involved in the performance management process. When the learners were presented with a pictorial representation of the process, they could understand the process better without any confusion. Simulations are used to give learners the opportunity to practice a skill or process in a risk-free environment. It allows them to make mistakes and learn from them to build their skill sets. For instance, if you push a junior sales guy, without any prior knowledge, to complete a sale with a POS terminal, it is quite unlikely that he would be able to complete the task. On the other hand, if you present the scenario in a simulated environment, they can learn by participating. Ensure that the simulation created for the performance management module is realistic and relatable. Simulations for software training are especially useful to train a large number of employees on a new software application and end-users so as to ensure they don’t make serious mistakes while handling live applications. Apart from the euphoria and motivation that games provide, they also enable learners to grasp the concepts presented through games. Through games, the management is better able to determine where they are lacking, in terms of reaching the goals. Games provide the ‘why’, ‘how’ and ‘where’ of solving issues. For instance, Bob, the retail manager of a manufacturing unit and Dwayne, the junior sales reps, were assigned the task of managing a new software. Bob had to overlook Dwayne’s ability to handle the software, while Dwayne had to skillfully work on the software. Through games, Bob got a clearer picture of how he could motivate Dwayne, while the latter learned the skills needed to handle the software and he also understood where he had to be more cautious. Both of them could improve their respective skills when they were presented the challenges in a gamified approach. The desired behaviors and outcomes were achieved. Each aspect dealt with areas where subordinates were to be reviewed. This approach proved to be quite useful as learners were able to understand the roles and responsibilities of a manager. You can integrate these instructional strategies to enhance your performance management training courses. These online learning strategies will surely benefit your learners and your organization, and you could also boost the return on the training investment. I hope these strategies are useful and effective. Do share your thoughts. What, Why, and How to Use Avatars in E-learning Courses?